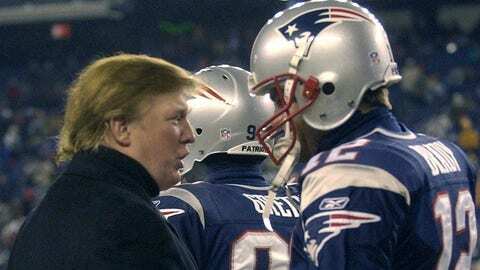 Six members of the New England Patriots have said they will not be making the White House visit, which is a customary trip for champions of American college and professional sports. Multiple Patriots players have cited their opposition to President Donald Trump as the reason they will not go. Brady is referring to his absence when the Patriots visited President Obama at the White House following their victory over the Seattle Seahawks in Super Bowl XLIX. Brady has visited the White House four times—three times with the Patriots and once with the University of Michigan. Brady is friends with President Trump and displayed a “Make America Great Again” hat in his locker shortly after the businessman announced his candidacy for the Republican nomination. Patriots owner Robert Kraft and coach Bill Belichick are also friends with Trump.